The screen looks impressive and it is. The 3.1 inch screen is a Super AMOLED display providing 720 x 720 resolution. It looks bright and clear and combined with Blackberry’s decision to use main apps with black backgrounds you can expect clear writing which is easy to view at any angle. The use of black backgrounds also helps to maintain a good battery life, something that’s very important for those using their phone for business purposes. 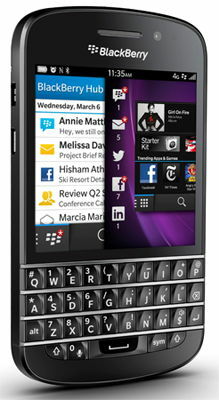 The Blackberry® Q10 is the perfect phone for the business user. The Qwerty Keyboard makes it easy to write emails, reply to messages and browse online. Adjusting documents and reading files is easy too as the phone comes with an excellent 3.1 touch screen so you have the best of both worlds; the keyboard for extensive typing and touchscreen for interactive and fast actions with just one touch. The latest Blackberry® Smartphone is robustly made thanks to the glass weave construction found on the back of the handset. The material has double the strength of plastic and is combined with a stainless steel side casing layer – so bumps and drops shouldn’t cause disastrous damage to the device. Those familiar with Blackberry® will certainly be impressed with the way this phone performs. The 1.5 GHz CPU and 2GB of Ram will also ensure this phone is a solid performer. A serious phone for anyone who expects a lot out of their mobile devices.